Share what you thought about An Unexpected Truth and earn reward points. 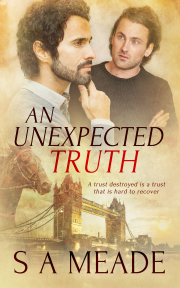 I say give An Unexpected Truth a read because sometimes in life it is the unexpected truths of reality that teach us the most and bring us the greatest joys, even if they don't seem to at the time. Adam and Brendan's journey has certainly cemented SA Meade's place on my authors-to-watch list and I look forward to checking out more of her backlist as well as future works. Meade wrote a great book with sweet characters, who had me rooting for rooting for their happy ending. I would recommend this book to most fans of the genre. I discovered this author's writing last year... and she delivers again. The writing is beautiful and transports you to the English countryside as new racing horse owner Adam arrives at horse-trainer Brendan's stables and we see their attraction to each other blossom in a slow-burn of interactions... A beautiful steady-paced story with a cast of interesting characters and a few twists that will keep you reading to the end. The writing is proficient, clean, and very easy to read. The author manages to seamlessly take us between the racing stables and London, while making both feel real. Even the description of the food — so much food! — was natural and organic and only added depth to the story. This was a beautifully written story, taking me right into the English countryside and the world of horse training. The writing style and world were well done and I really loved that this one was unapologetically British.